Minecraft studio Mojang has, entirely without warning, released a brand-new game on Steam called Crown and Council. 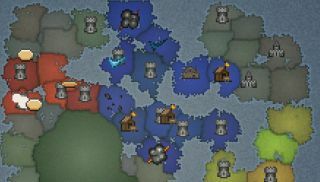 It's a “casual strategy game of geopolitical drama,” originally created for a game jam, with 75 included maps and a built-in generator that can create new ones on the fly, and it's entirely free. The rules are simple: Each turn you earn a certain amount of gold based on the number of territories you own, and can spend any or all of it in any way you see fit. Launch attacks, fortify your holdings, or just sit back and let your enemies exhaust themselves against each other while your treasury grows fat. I've only played a few rounds, not nearly enough to make a meaningful judgment, but so far it seems surprisingly decent as a pseudo-Risk kind of experience, and it does have a deceptively simple vibe to it too. And it's free! That's a big plus. Snag it from Steam.